The SP leader claimed that his remark was taken out of context, and that he will not contest if he can be proven guilty of making remarks against a woman politician. 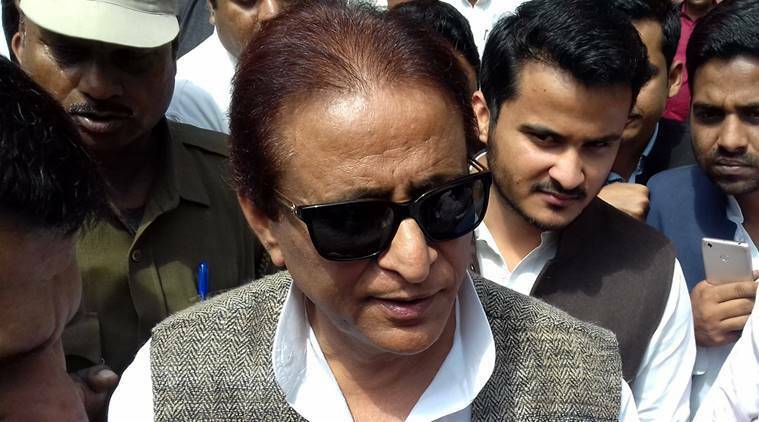 A day after senior SP leader and the SP-BSP-RLD alliance candidate from Rampur, Azam Khan, allegedly made derogatory remarks against his BJP opponent Jaya Prada at a public meeting, local police on Monday lodged an FIR against Khan, while the National Commission for Women (NCW) issued him a notice and urged the Election Commission (EC) to take take strong action against his “extremely offensive, unethical” words. Meanwhile, another video emerged on social media in which Khan was heard making derogatory comments against the District Magistrate (DM), asking people not to be scared of “collector” (DMs), as they are mere salaried employees, and the Opposition alliance, if it wins the polls, will make them clean shoes. The FIR, filed at Shahabad police station in Rampur, is based on a complaint by Mahesh Kumar Gupta, a local government college principal who has been deputed by the district administration as in-charge of the election flying squad. It was filed under IPC Section 509 (word, gesture or act intended to insult the modesty of a woman) and Section 125 of Representation of the People Act, Rampur SP Shiv Hari Meena, said. Addressing a rally on Sunday, with SP chief Akhilesh Yadav and other SP leaders on the dais, Khan allegedly commented on Jaya Prada’s association with the RSS and, without naming anyone, said the underwear is of khaki colour. In its notice, the NCW noted that Khan made “sexist comments on a lady politician” and has made several such “derogatory remarks against women in the past”. NCW chairperson Rekha Sharma also wrote to Chief Election Commissioner Sunil Arora about Khan’s “below-the belt ‘khaki’ comments” and his statement about how Jaya Prada “will enthral voters with her ghungroos and thumkas”. Sharma also pointed out that the remarks are in violation of EC’s model code of conduct.